Features vignette border sketches of Oberlin's role in the Underground Railroad which helped escaped slaves reach Canada. 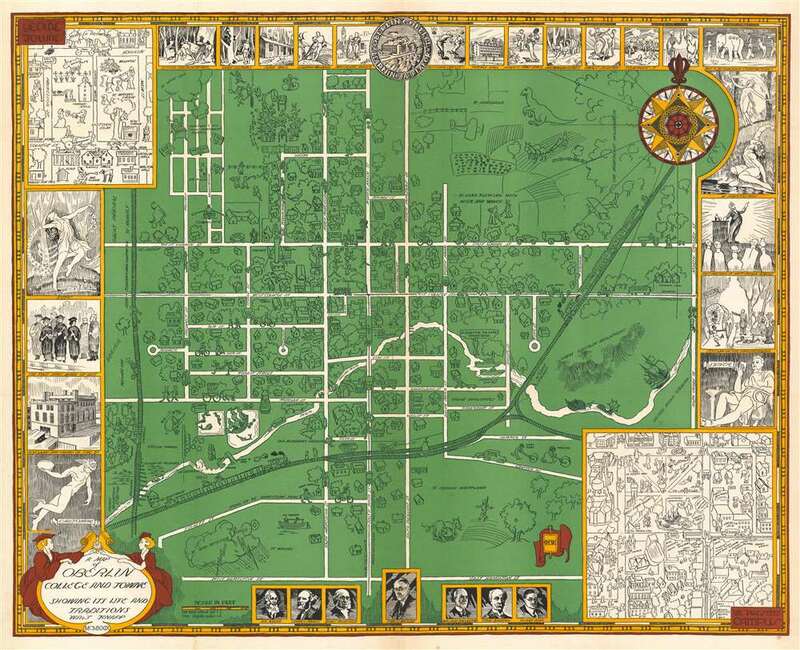 A Map of Oberlin College and Towne Showing Its Life and Traditions. This is a 1929 Walter Knapp map of Oberlin, Ohio and Oberlin College with fascinating 'Underground Railroad' and temperance references. The map depicts the town of Oberlin from the Lorain, Ashland, and Southern railroad line to North Crosby Street and from the football field to West Hamilton Street. Nearly all the streets are labeled, while houses and other buildings illustrated throughout. Churches, inns, taverns, and the yacht club are labeled as well. Some of the labels, such as the haunted house and the mermaid next to the 'bridge of size' are charming and reflect local folklore and whimsy. For example, a dinosaur inhabits the top right corner of the map, near 'Ye land flowing with milk and honey.' The train for New York City cuts through town. In the upper left corner, an inset map of 'Ye Olde Towne' is situated, with several locations labeled around town, including several halls, a lag cabin, and a stop sign. In the lower right corner sits a plan of 'Ye Present Campus', which labels several churches, shops, and other locations, but no college buildings. Several characters are illustrated throughout this inset map, including a roving band of musicians near the left border and a photographer. A portrait of the President of Oberlin College, Ernest Hatch Wilkins is placed at the center of the bottom border and is flanked by portraits of other university dignitaries. A decorative title cartouche is situated in the lower left corner. Vignettes of various scenes around Oberlin, from its founding to the time when the map was produced create three sides of the border. Some of these scenes are quite comical, such as the 'early disputes' between the early settlers and the local wildlife, i.e. bears, or a mock republican convention, complete with an elephant. Illustrations of the four seasons also make up parts of the border, and the captions are in French instead of in English. A sketch of the first meeting of the Anti-Saloon League also makes up part of the border, since Prohibition was still the law of the land and would be until 1933. While some of these scenes illustrated along the border appear quite comical, others are significantly more serious. One such image, situated along the top border, illustrates a black man fleeing from a white man holding a whip and bears the caption 'Darkness Comes Apace.' Obviously, this image is meant to evoke memories of runaway slaves and the Fugitive Slave Law. Another vignette includes an image of a covered wagon being pulled by a team of horses captioned 'Underground Express'. Yet another vignette is captioned 'Station on the Underground' and illustrates a group of former slaves, of varying age, being instructed to get in a covered wagon on 'Track 9'. These images are incredibly important historical moments and refer to Oberlin's history as an important waypoint on the Underground Railroad. Situated near Lake Erie, which occupies the border between U.S. and Canada, Oberlin functioned as Station 99 in the secret escape system. Once in Oberlin, runaway slaves were nearly in Canada, which did not have a Fugitive Slave Law, allowing escaped slaves to finally be free of pursuit. This map was produced by Walter Knapp and published in 1929. Very good. Verso repairs of minor fold separations. Blank on verso.